More than 130 people die each day in the United States after overdosing on opioids. More than 70,000 people died of drug overdoses in 2017 -- nearly 10 times the number in 1979 -- with more than 47,000 of these overdoses involving opioids. Opioid overdose deaths now exceed the number of deaths due to car accidents (about 40,000 in 2017) or gun violence (also about 40,000), and exceed the number killed by HIV/AIDS at its peak (43,000 deaths in 1995). Opioids include prescription pain pills, heroin, and ultra-potent synthetic opioids like fentanyl. Humans have used opium and its derivatives for millenia, and history records many periods of rampant opioid addiction. But today’s epidemic is deadlier than any in history. Why? The current epidemic was fueled by the fraudulent mass marketing and aggressive distribution of opioid pain pills like OxyContin beginning in the late 1990s. Purdue Pharma and other drug makers persuaded doctors and regulators that patients would not become addicted to these pills. Based on Purdue’s flimsy and misleading data, enhanced by financial rewards to prolific prescribers, doctors medicated much of the U.S. population with highly addictive pain relievers. The number of opioid prescriptions dispensed in a single year peaked in 2012 at 255 million. A significant number of patients (studies indicate between 8% and 12%) who are prescribed opioids for chronic pain develop an opioid use disorder. Thus the largest pharmaceutical mass marketing campaign in history created the largest-ever cohort of opioid-addicted Americans. Overdoses from prescription opioids started a steady climb around 2000, representing the first wave of the current epidemic. Heroin represented the second wave. In pockets of the country, heroin had taken root in the 1970s and never left -- afflicting inner cities and, disproportionately, people of color. But the hundreds of thousands of Americans newly hooked on pain pills created a fertile market for expansion by heroin dealers -- particularly as belated crackdowns on opioid overprescribing cut off the supply of pain pills available to many, and drove them to cheaper street drugs. An estimated 4-6 percent of those who misuse pain pills transition to heroin; about 80 percent of people using heroin first misused opioid pain pills. Aside from its cheaper price, there is one critical difference between heroin and presciption pills: the potency of heroin and other street drugs is unpredictable -- resulting in a far greater rate of overdose. After 2010, heroin overdose deaths began a sharp, steady climb. 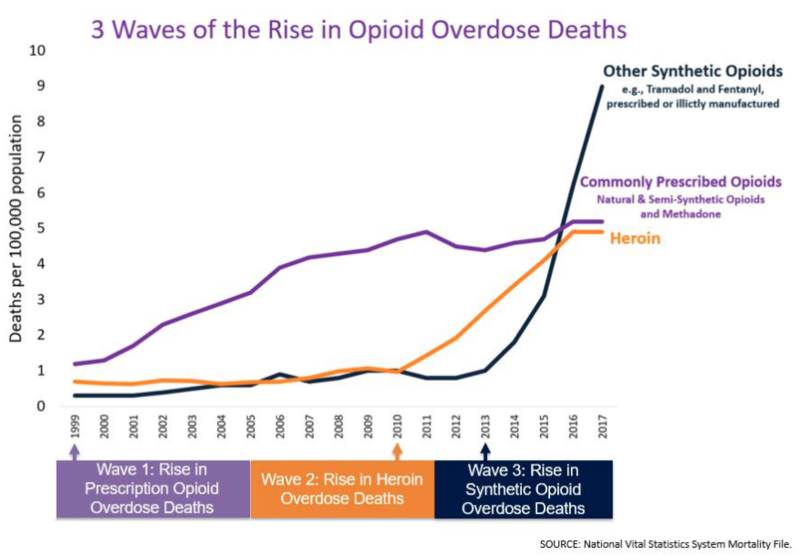 The third wave began just a few years ago with the spread of fentanyl and other synthetic opioids in the supply of U.S. street drugs. Cheaper and far more potent than heroin, and flooding into the U.S. primarily from Chinese suppliers, fentanyl has become the drug of choice among some heroin users, but in most cases is used not by choice but unwittingly. Users of heroin or other street drugs often aren’t aware that their “heroin” is in fact tainted with fentanyl. (Or, importantly, they may be aware of this possibility but don't have access to fentanyl test strips or other means to determine the contents of their drugs. Studies show that this applies to street-level dealers as well.) This recipe -- a large pool of regular opioid users dependent on a supply of deadly drugs with wildly unpredictable potency -- has been disastrous. In 2016, deaths involving fentanyl surpassed those involving heroin or prescription opioids. In one year, between 2016-2017, the U.S. death rate from overdoses involving fentanyl increased by 45%.